The Dr Shezad Malik Law Firm helps folks get the recovery they need after being exposed to Benzene, this highly toxic industrial solvent. Benzene is an aromatic hydrocarbon that is a component of products derived from coal and petroleum and is found in gasoline and other fuels. Folks employed in benzene industries include benzene production (petrochemicals, petroleum refining, and coke and coal chemical manufacturing), rubber tire manufacturing, storage or transport of benzene and petroleum products containing benzene. Other workers who may be exposed to benzene because of their occupations include steel workers, printers, rubber workers, shoe makers, laboratory technicians, firefighters, and gas station employees. Benzene is a colorless, flammable liquid, it evaporates quickly when exposed to air. Benzene is among the 20 most widely used chemicals in the United States. It is used mainly as a solvent (a substance that can dissolve or extract other substances) and as a starting material in making other chemicals. Benzene is also a natural part of crude oil, gasoline, and cigarette smoke. How does Benzene Exposure Occur? The exposure to benzene occurs by inhaling contaminated air. Benzene can also be absorbed through the skin during contact with a source such as gasoline, but because liquid benzene evaporates quickly, skin absorption is less common. People can be exposed to benzene at work, in the general environment, and through the use of some consumer products. Workers in industries that make or use benzene may be exposed to high levels of this chemical. These industries include the rubber industry, oil refineries, chemical plants, shoe manufacturers, and gasoline-related industries. Benzene is also used to make some types of lubricants, dyes, detergents, drugs, and pesticides. 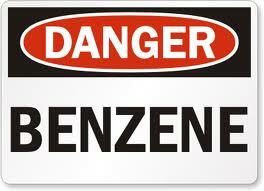 Other people who may be exposed to benzene at work include steel workers, printers, lab technicians, and firefighters. Sources of benzene in the environment include gasoline, automobile exhaust fumes, emissions from some factories, and waste water from certain industries. Exposures can be substantial to people in enclosed spaces with unventilated fumes from gasoline, glues, solvents, paints, and art supplies. Areas of heavy traffic, gas stations, and areas near industrial sources may also have higher air levels. Cigarette smoking and secondhand smoke are important sources of exposure to benzene. Cigarette smoke accounts for about half of the US national exposure to benzene. Benzene levels in rooms contaminated by tobacco smoke may be many times higher than normal. Benzene is known to cause cancer, based on evidence from studies in both people and laboratory animals. The link between benzene and cancer has largely focused on leukemia and cancers of other blood cells. Rates of leukemia, particularly acute myeloid leukemia (AML), have been found to be higher in studies of workers exposed to high levels of benzene, such as those in the chemical, shoe making, and oil refining industries. Some studies have also suggested links to acute lymphocytic leukemia (ALL) in children and to chronic lymphocytic leukemia (CLL) and other blood-related cancers, such as multiple myeloma and non-Hodgkin lymphoma, in adults. The International Agency for Research on Cancer (IARC) is part of the World Health Organization (WHO). Its major goal is to identify causes of cancer. IARC classifies benzene as a "known human carcinogen", with "sufficient" evidence that benzene causes acute myeloid leukemia (AML). The National Toxicology Program (NTP) is formed from parts of several different US government agencies, including the National Institutes of Health (NIH), the Centers for Disease Control and Prevention (CDC), and the Food and Drug Administration (FDA). The NTP has classified benzene as "known to be a human carcinogen". Does Benzene Exposure Cause any Other Health Problems? Breathing in high doses of benzene may affect the central nervous system, which can lead to drowsiness, dizziness, headaches, tremors, confusion, and/or unconsciousness. Consuming foods or fluids contaminated with high levels of benzene can cause vomiting, dizziness, sleepiness, convulsions, and rapid heart rate. In extreme cases, death may occur after inhaling or swallowing very high levels of benzene. Exposure to benzene liquid or vapor may irritate the skin, eyes, and throat. Skin exposure to benzene may result in redness and blisters. Anemia (a low red blood cell count), which can cause a person to feel weak and tired. A low white blood cell count, which can lower the body's ability to fight infections and may even be life-threatening. A low blood platelet count, which can lead to excessive bleeding. Several government agencies regulate benzene levels and exposures. The Occupational Safety & Health Administration (OSHA), the federal agency responsible for health and safety regulations in most workplaces, limits workplace exposure to benzene in the air to 1 ppm (part per million) during an average workday and a maximum of 5 ppm over any 15-minute period. When working at potentially higher exposure levels, OSHA requires employers to provide personal protective equipment such as respirators. The EPA limited the percentage of benzene allowed in gasoline and as of 2011, this limit is reduced to an average of 0.62% (with a maximum of 1.3%). The EPA limits concentrations of benzene in drinking water to 5 ppb (parts per billion). The US Food and Drug Administration (FDA) set a limit of 5 ppb in bottled water. How to Limit Exposure to Benzene? If you are concerned about Benzene, there are several ways you can limit your exposure. If needed, the Occupational Safety & Health Administration (OSHA) can provide more information or make an inspection. Try to limit gasoline fumes by pumping gas carefully and choosing gas stations with vapor recovery systems that capture the fumes. Avoid skin contact with gasoline. Use common sense around any chemicals that might contain benzene. Minimize or avoid exposure to fumes from solvents, paints, and art supplies, especially in unventilated spaces. Information and commentary provided by Dallas Fort Worth Personal Injury Attorney Dr Shezad Malik. The Dr Shezad Malik Law Firm can be contacted in Dallas toll free at 888-210-9693. If you or a loved one has been injured from Benzene exposure, please fill out our contact card for a free consultation.